We’re at the BIC of course, but this isn’t necessarily a track test. If it were, we could simply crown the Jag F-Type the winner and go home. We’re at the BIC because it’s the perfect venue to test cars in a controlled environment. Of course, we don’t altogether mind pounding around the racetrack in the name of science. Speaking of which, we’ve tried to be as sensible about this as possible. Now pay attention. Each car here has been rated on the following criteria. Five points each were awarded for Quality, Comfort / Space, Refinement, Design, Drivetrain, Ride, and Practicality. In terms of Quality, for instance, the Audi A8 gets 5 points while the Toyota Etios Cross gets 2 points. The A8 may well be the benchmark, but the new Hyundai i20 gets a healthy 4 not only because its quality levels are high – which they are – but also because it ups the game significantly in the hatchback space. X-Factor gets 15 points, because that special something is important to us in our cars. This could be anything from the famed ‘M’ badge at one end of the scale, to a perfect driving position in the Ford Fiesta at the other. Lap Time gets 20 points, because it takes into account all the dynamic aspects of a car – such as power, high-speed stability, handling, braking, etc. And, well, we all like to drive – so it’s important to us! In an effort to be sensible however, Value for Money gets the most points – at 30. After all, it’s important to get what you’re paying for. This includes an element of resale value as well, so we’ve also kept in mind how well a car retains its value. For this test, we attempted to get our hands on all the cars that were either new, or have been significantly revised, for 2014. So, cars like the Ford Fiesta and Fiat Punto were included because they were significantly reworked, while the Jag XF and Skoda Rapid were part of the test because they have brand new engines under the bonnet. The entire team of five autoX road-testers voted, and the votes were averaged. Points were awarded based on feel, and each point was debated to ensure that everyone had their say. The only objective field was lap time, which was calculated using our VBOX, as well as transponders from the track. The fastest car of the bunch was the Jaguar F-Type at 2:20.3, while the slowest car was the Datsun Go at 3:06.3 – a spread of 46 seconds, which equates to .43 points per second. 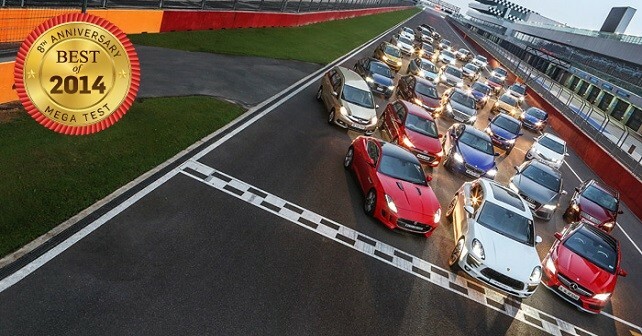 Each car was awarded specific points based on its deficit to the F-Type. The important thing, though, is that the points are well balanced between the mundane and the exciting. And, more importantly, the results are completely transparent. That’s something that was absolutely crucial for us. So, turn the page to see how each of these 33 machines fared.